There are so many things to talk about, but these aren't a good idea. When young adults return home for the holidays, parents are naturally curious to see how they look - are they healthy? Happy? Do they need new shoes? Parents also look forward to talking face-to-face with their kids after, for some families, a long time apart. Whether your young adult is a college freshman or a 20-something out on their own, the excitement of seeing your son or daughter walk through the door may lead to comments or questions that, perhaps, should not be said or asked. Before you say something that might upset, offend or insult your young adult, consider your words carefully. Have you gained weight? If you have to ask, chances are your child probably has put on a few pounds. And if you notice it, it's fairly certain he or she has noticed it, too. Right before eating Thanksgiving dinner or being confronted with a table laden with Christmas goodies is not the time to bring up the issue of weight gain. In fact, it's really never a good time. Let your young adult come to you with concerns about his or her number on the scale, and then offer suggestions as needed. Are you dating anyone? Think of it this way: if your child is dating someone that matters to him or her, you will hear about it. If, on the other hand, dating is a sore subject - perhaps he or she was treated badly, ghosted, or is simply not meeting anyone worthwhile - then your question will only bring up bad feelings. As with the issue of weight, young adults will come to their parents for input and advice when they need it and are ready to ask. Everyone moves at a different pace, so while some of their friends may be getting married or even starting families, your young adult may not be ready - or even interested - in going in that direction at this time. Are you paying your bills? If you want your young adult to live independently and you aren't prepared or interested in handing over any money to him or her, this question is out of bounds. Finances - even your children's - are private matters, and boundaries need to be respected. If your young adult is in financial distress, he or she will come to you for help if it's the appropriate and comfortable thing to do, so leave the question of money out of the holiday conversations - and consider giving a check instead of a gift for Hanukkah or Christmas if you think there may be a bit of a struggle. Considering how expensive it can be to live, cash is most likely the most welcome and appreciated gift any 20 something can receive. You should visit more often. Maybe your child doesn't come home as often as you'd like. Perhaps he or she has chosen to spend off-time with friends rather than visiting family more frequently than you think he or she should. This is something you should, at some point, have a conversation about - but not during the holidays. 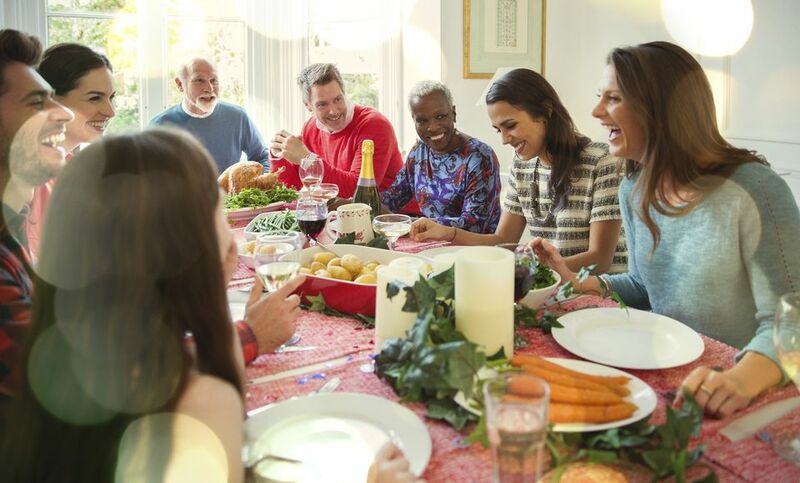 This is the time to enjoy being a family, to avoid confrontation (though it can be difficult) and to celebrate. Leave the uncomfortable chat for another time. Do you have anything nicer to wear? When they were eight or ten or even eighteen, parents had a right - indeed, a responsibility - to teach children how to dress appropriately for events. Though our society has grown much more casual in recent years, as parents we knew when it was time to step in and say "that doesn't work." However, once your child has grown up and is a young adult, it's no longer your responsibility - or your business - to tell him or her what to wear. You may not think he or she is dressed properly for Thanksgiving dinner or Christmas brunch, but it's not your place to say so. And remember, your child, now a grown-up, is no longer a reflection of your values - he or she has evolved into an independent adult with his or her own standards.